Late one June afternoon in 1969, the joking Eufemia had cajoled a then-youthful Faustino—who years later guided me to the Big Hill or Hatun Loma field—while she heaped platefuls of steaming floury potatoes with meaty hominy and ladled frothy maize beer into a glass that was being passed around. A tipsy Faustino was serving the homemade brew and the maize and potato plates to family and neighbors, who had finished stacking the adobe walls and thatching the roof of the newlyweds' home. The couple's jest hinted at their happiness with the new single-room hut. Its site even offered some space for future expansion of their quarters. They owed the site to Faustino's father, once a tenant worker of the Umamarca hacienda. His family was an updated version of Quechua haves, and both Faustino and Eufemia planned to pursue the current concept of a fit livelihood. Two of the world's most pressing needs—biodiversity conservation and agricultural development in the Third World—are addressed in Karl S. Zimmerer's multidisciplinary investigation in geography. Zimmerer challenges current opinion by showing that the world-renowned diversity of crops grown in the Andes may not be as hopelessly endangered as is widely believed. He uses the lengthy history of small-scale farming by Indians in Peru, including contemporary practices and attitudes, to shed light on prospects for the future. 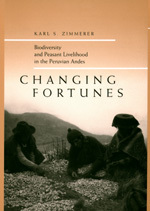 During prolonged fieldwork among Peru's Quechua peasants and villagers in the mountains near Cuzco, Zimmerer found convincing evidence that much of the region's biodiversity is being skillfully conserved on a de facto basis, as has been true during centuries of tumultuous agrarian transitions. Diversity occurs unevenly, however, because of the inability of poorer Quechua farmers to plant the same variety as their well-off neighbors and because land use pressures differ in different locations. Social, political, and economic upheavals have accentuated the unevenness, and Zimmerer's geographical findings are all the more important as a result. Diversity is indeed at serious risk, but not necessarily for the same reasons that have been cited by others. The originality of this study is in its correlation of ecological conservation, ethnic expression, and economic development. Karl S. Zimmerer is Associate Professor of Geography and Environmental Studies at the University of Wisconsin, Madison.